NEWARK, NJ (June 15, 2016) – Panasonic unveiled a new LEICA DG SUMMILUX 12mm/F1.4 ASPH. (35 mm camera equivalent: 24 mm) digital interchangeable lens for Digital Single Lens Mirrorless camera based on the Micro Four Thirds standard. The new 12mm wide-angle lens enables photographers to capture beautiful group, event, and nature photography. It also allows indoor shooting in low lighting and produces an impressive, natural defocusing effect with its F1.4 aperture. In addition, the LEICA DG SUMMILUX 12mm/F1.4 ASPH. boasts a rugged, splash/dust-proof design (when combined with splash and dustproof LUMIX G Mirrorless camera models) to meet the needs of a wide-range of photographic situations. Integrating two aspherical lenses, two UED (Ultra Extra-Low Dispersion) lenses and an ED (Extra-Low Dispersion) lens, the lens system is comprised of 15 elements in 12 groups. The adoption of five special lenses makes it possible to meet the stringent LEICA standard for exceptional image quality with high resolution and minimum distortion. In general, flare is commonly seen around the periphery of a point source with many high-speed lenses when a large aperture is employed. 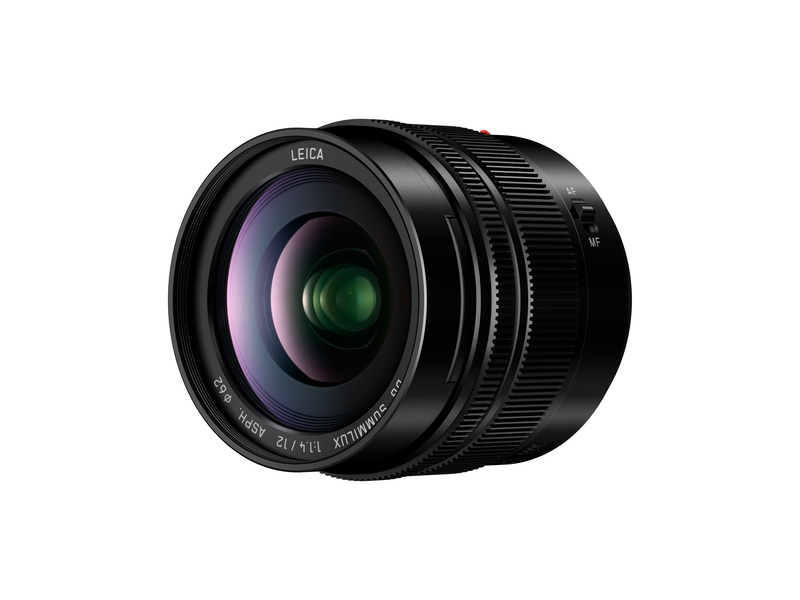 However, the new LEICA DG SUMMILUX 12mm/F1.4 ASPH. achieves high resolution from the center of the image to the corners by suppressing this flare. Users can take advantage of this lens to shoot a brilliant night skies or night scenes containing illumination to capture true-to-life images with minimal blurring and distortion at the edges. The multi-coated lens elements also minimize ghosting and flaring. Incorporating an inner focus drive system and a stepping motor, the new LEICA DG SUMMILUX 12mm/F1.4 ASPH. is capable of smooth, silent operation together with the camera’s high-speed, high-precision contrast AF system for both photo and video recording. It is also compatible with the sensor drive at a maximum of 240 fps to take full advantage of cameras with high-speed AF. This stunning AF performance is excellent for recording 4K videos, where precise focusing is essential. The LEICA DG SUMMILUX 12mm/F1.4 ASPH. comes with an aperture ring for direct, intuitive aperture control. Nine blades give the aperture a rounded shape that produces an attractively smooth effect in out-of-focus areas when shooting at larger aperture settings. A highly reliable metal mount assures durability for repeated use. The lens mount, the barrel and the hood are all made of metal to provide a sleek, sophisticated design that matches the entire line-up of LUMIX G Digital Single Lens Mirrorless (DSLM) cameras. To learn more about Panasonic’s line of other consumer electronic products please visit www.shop.panasonic.com.